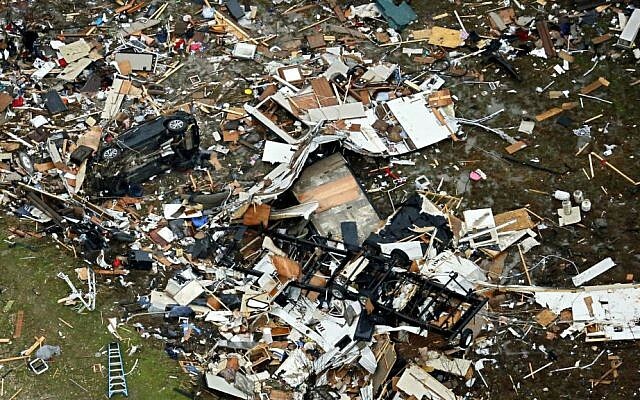 GARLAND, Texas (AP) — At least 11 people died and dozens were injured in strong tornadoes that swept through the Dallas area and caused substantial damage this weekend, while 13 people died in flooding in the Midwest. 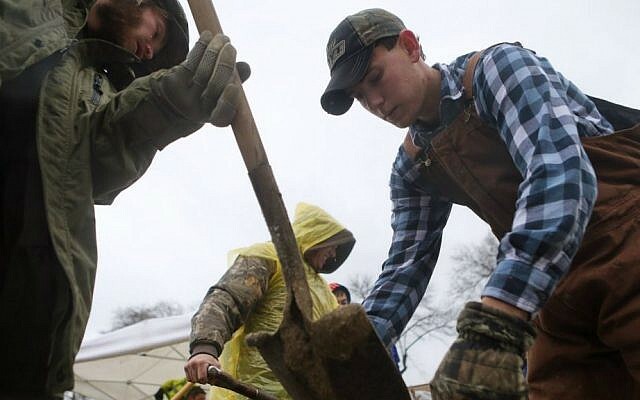 It was the latest of a succession of powerful weather events across the country, from heavy snow in New Mexico, west Texas and the Oklahoma Panhandle to flooding in parts of the Plains and Midwest. 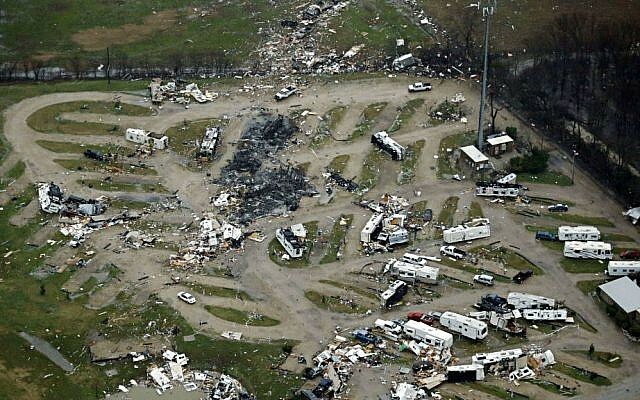 Days of tumultuous weather have led to 43 deaths overall — those in Texas, plus five in Illinois, eight in Missouri and 19 in the Southeast. The full extent of damage from Saturday’s storms along a nearly 40-mile stretch near Dallas came into clear focus. Local officials estimated as many as 1,450 homes were damaged or destroyed. Vehicles were mangled, power lines fell and trees were toppled. 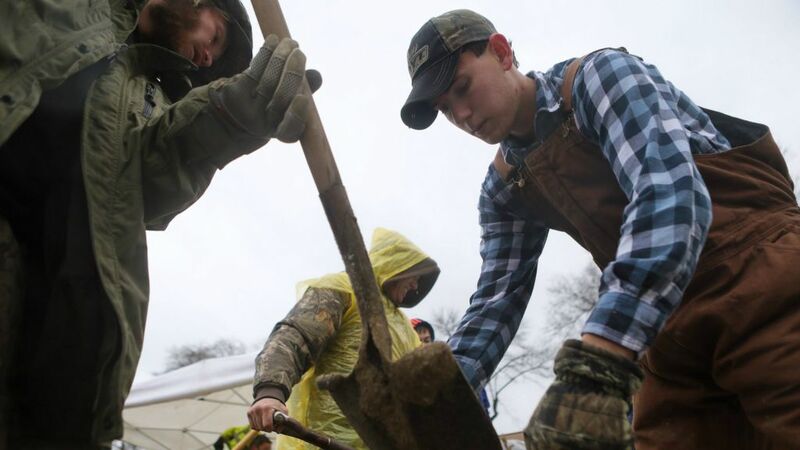 Heavy rain, wind and falling temperatures hampered cleanup efforts Sunday afternoon. “This is a huge impact on our community and we’re all suffering,” Garland Police Lt. Pedro Barineau said of the suburb about 20 miles northeast of Dallas, where eight people died, 15 were injured and about 600 structures, mostly single-family homes, were damaged. The weather service said an EF-4 tornado, which is the second-most powerful with winds up to more than 200 mph (322 kph), hit the community at about 6:45 p.m. Saturday. It was near the intersection of Interstate 30 and George Bush Turnpike, which is a major route in the region. At least three people who died were found in vehicles, said Barineau, who also noted that some cars appeared to be thrown from the interstate, though it wasn’t known whether that was how the people found in the vehicles died. Natalie Guzman, 33, took photos of her family’s home in a Garland neighborhood. The garage wall had collapsed and the roof fell in. The only part of the house that appeared to be spared was the master bathroom, where her brother-in-law took shelter Saturday night. He was the only one at home and told her he had just enough time to get himself and his dogs into the bathroom. “It was worse than I thought,” Guzman said, comparing the scene to the photos he had sent Saturday. The destruction in Garland was so overwhelming that Dallas County Judge Clay Jenkins declared the city a disaster within mere minutes of seeing the toll firsthand. In the nearby town of Rowlett, City Manager Brian Funderburk said Sunday morning that 23 people were injured, but that there were no deaths and no reports of missing people. The weather service said damage indicated it was likely an EF-3 tornado, which has winds up to 165 mph (265 kph). Jenkins said in a statement Sunday night that as many as 600 homes were damaged in Rowlett. Dale Vermurlen lived in a Rowlett neighborhood that sustained heavy damage. His house only had minor damage, but was next to others that were flattened. Homes in the neighborhood that had been searched by emergency responders were marked with a black “X.” In some instances, it looked like homes had been picked up and set back down in a big pile. State troopers blocked off roads, utility crews restored power and people walked around, hushed and dazed. Three other people died in Collin County, about 45 miles northeast of Dallas, according to sheriff’s deputy Chris Havey, although the circumstances were not immediately clear. On the other side of the state, the Department of Public Safety in Amarillo strongly discouraged travel throughout the entire Texas Panhandle — a 26-county area covering nearly 26,000 square miles — because blowing and drifting snow had made the roads impassable. Interstate 40, the main east-west highway across the Panhandle, was almost completely shut down. DPS said only a small section of the highway in Amarillo remained open. Meanwhile, Oklahoma Gov. Mary Fallin declared a state of emergency as there were blizzard conditions and an ice storm warning out west and flood warnings in the east, where one community had received 9 inches of rain. 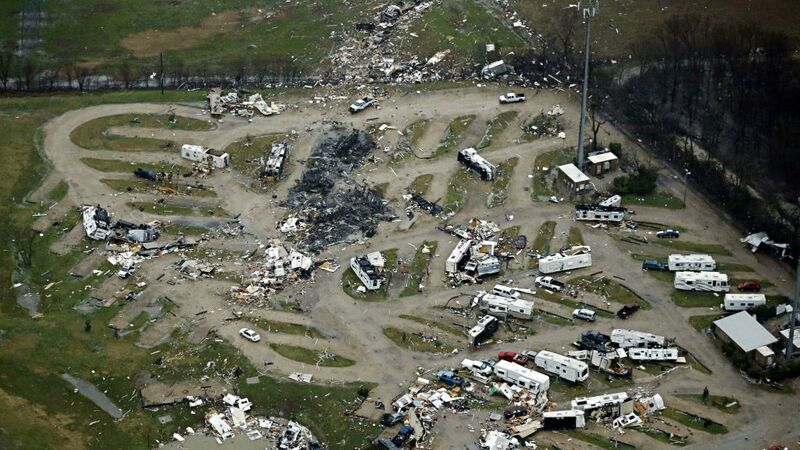 The state Department of Emergency Management said eight storm-related injuries were reported. About 60,000 homes and businesses were without power. 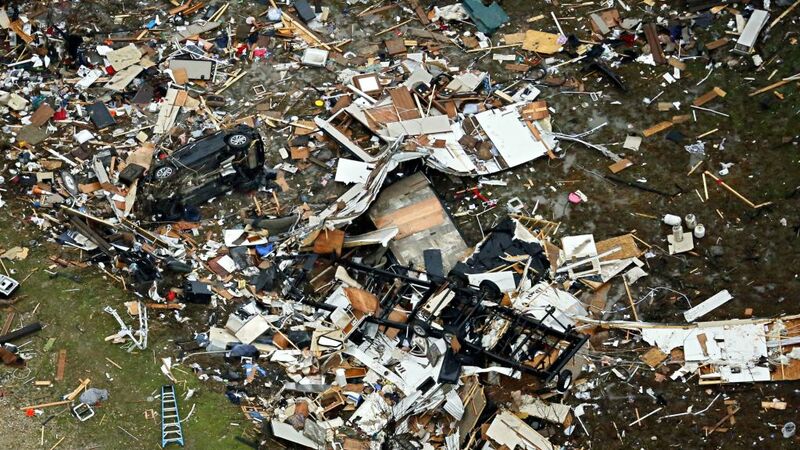 In neighboring Arkansas, officials said it appeared that a tornado touched down in Bearden, tearing roofs off buildings and uprooting trees. There were no immediate reports of injuries. Further north, rain caused dangerous driving conditions and flooding in Missouri, where Gov. Jay Nixon also declared a state of emergency, and Illinois. Six people died overnight when two separate vehicles drove into flooded roadways in south-central Missouri, Pulaski County Sheriff Ronald Long said. Greene County authorities said two fatalities there were associated with the flooding. The death toll in the Southeast linked to severe weather rose to 19 on Sunday when Alabama authorities found the body of a 22-year-old man whose vehicle was swept away while attempting to cross a bridge; a 5-year-old’s body was recovered from that incident Saturday. Ten people have died in Mississippi, and six died in Tennessee. One person was killed in Arkansas.